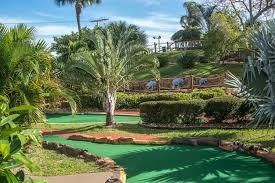 Everyone Loves Mini Golf ...Come Play Our Two Exciting Courses! 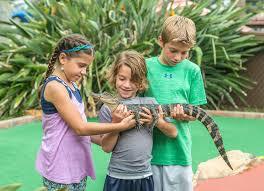 Golf N Gator is home to 30 American Alligators of different ages and sizes! These animals are usually found only in the southeastern United States. According to Florida State University, over 1.5 million Alligators inhabit Florida. Our gators spend their time just like wild gators: lurking in the water or sunbathing on land. While you are here, you can hold our young gators and feed the bigger ones in the swamp. We have a wonderful staff of educated handlers that are ready to make your gator experience a memory to last a lifetime! You knew taking on this course would be an adventure. 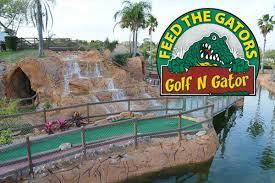 Golf your way to the peak of Gator Mountain! You might come across a few obstacles on the way, but the view from the mountaintop of the waterfall and grounds are well worth the journey! Golf N Gator is home to two 18 hole courses. You can play Gator Mountain, Swamp Cave or choose to play both! The courses weave through tropical landscaping with streams and waterfalls. 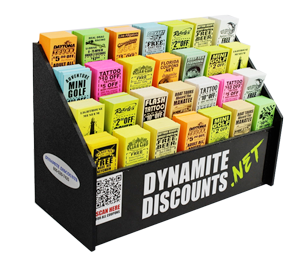 Spin the challenge wheel to show off your miniature golf skills! Enjoy your view of our two giant ponds where alligators, turtles and fish abound! Cross over the bridges, who might be lurking below? Can you make it through the course? First, you wind through swamps and ponds. As your adventure continues, you realize you have arrived at a dark cave. What could be lurking inside?